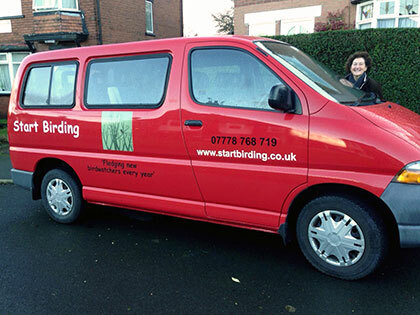 Start Birding classes are aimed at adult beginners and people who are wanting to improve their birdwatching skills. There is a continuous programme of classes running throughout the year which enables you to observe the seasonal changes and migration of birds in the UK. All classes can be booked individually. They are available from 2 hours to a full day. Classes are limited to 8 people to ensure that everyone has a great learning experience. This includes your birdwatching guide, binocular tuition, learning about different species and in most cases, the chance to see birds in detail through a high powered telescope. Refreshments and bird lists are also provided. Trips may be more expensive due to distance and whether there are other fees, e.g. for boat trips or entrance to reserves. On most occasions, I offer a pick-up point from the Moor Allerton Centre (just off the Leeds outer ring road). As part of my programme of events, I offer the chance to make new friends and learn in the company of regular birdwatchers. Join my Tuesday or Friday morning birdwatchers and either pay for individual sessions or save money and book classes in 6-8 week blocks. Classes are held all year round and you can interchange between Tuesdays and Fridays if you wish. The Tuesday club enjoys a mixture of 2 and 4 hour classes (9am to 11am or 9am to 1pm) visiting lots of places in and around Leeds. The Friday club is a little more leisurely with the option of breakfast at 9am followed by a 2 hour birdwatching session from 10am to 12 noon. Every Friday session is held in the Lower Aire Valley featuring Reserves such as St Aidan’s, RSPB Fairburn Ings and lots of other places managed by the Yorkshire Wildlife Trust and Leeds City Council’s Parks and Countryside Service. Transport is available from Leeds at 8am for most classes. From time to time I run one day taster sessions in and around Leeds. A Birdwatching Taster Day will give you a half day in the classroom learning about binoculars and field guides followed by an afternoon looking and birds and practising your new skills. Check the programme of events for weekend courses. These can run for 5 Sundays in a row or for a single weekend. Learn quickly by booking a one-to-one birdwatching class or design your own group birdwatching session for family or friends (up to 8 people). When you design your own session, you get to choose from a range of habitats such as woodland, wetland, moorland, river bank or coastal cliff. Alternatively, you may want to study a particular group of birds (such as wildfowl, birds of prey or waders), or target a favourite species. Contact me to discuss your preferences or for advice on what would suit your individual ability. 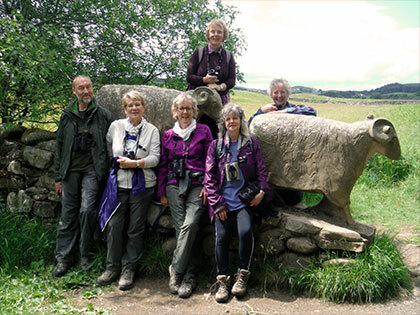 If you look after a nature reserve, or you’re part of a group that manages a special place in the Leeds area, then I can provide guided birdwatching walks or surveys for your group. I also run bird song listening events so that you can learn which birds are singing in your area. I teach indoor and outdoor sessions to families and groups of children on request. Please contact me to book a school visit or home schooling session. Provide a friendly and supportive learning environment. Binoculars are available on request. Only bring binoculars if you have them already. You don’t need to buy any especially for the class. As part of your first session, you will be given some useful information about binoculars. This will enable you to make an informed choice, when you do decide to buy, and prevent you from making an expensive mistake. British weather can be very changeable so please wear plenty of layers. Unlike walking, you’re not likely to generate much heat when birdwatching and it is easy to become cold. Bring a hat, gloves, scarf, waterproof jacket, over-trousers and waterproof boots. No jeans please! These get wet very easily (either by rain running off a jacket or by being in contact with wet vegetation). Look out for my indoor classes which run from September through til April.